This week’s Torah portion of Emor, according to the writings of Kabbalist Rav Isaac Luria and the Zohar, reveal the secrets of Golgotha and the resurrection of the dead. Golgotha is the place where Jesus was said to be crucified. Except Christian scholars and all the early founders of Christianity admit that the word is an Aramaic word and that they have no idea where Golgotha is or why this word was used for the whole idea of Jesus’s death and resurrection. Even the New Testament makes a point of telling us that Golgotha is an Aramaic word which means the place of the skull. The answer can be found in the Zohar. Commenting upon this week’s Torah portion, Rav Isaac Luria explains how the spiritual dimension called Atika Kadisha is the source of a “dew” that brings about resurrection of the dead. He further explains that the dew is really the three letters in the Tetragrammaton, Yod, Hei and Vav. The Tetragrammaton is the Four Letter Name of God. Now, why are three of these letters referred to as the dew? The 99% Reality is the hidden realm and source of all Light and wisdom that flows into our world. Why should any of us care about the Four Letters of God’s Name? The letters represent these hidden spiritual dimensions that are the source of all wisdom, life-force, creativity, knowledge, passion, love and Light that emanate and radiate from the force that we call Creator and the 99% reality. The final letter in God’s Name (the Hebrew letter Hei) refers to our physical world. You know this place very well. It’s where we find both order and chaos, darkness and Light, and pain and pleasure. This one letter is disconnected from the first three letters. What does this mean? It means our world is disconnected from these hidden Upper Dimensions. It means the lamp is not plugged into the wall socket to draw electrical energy and therefore the room, our world, remains in darkness. It means we are disconnected from the 99%. Because of this disconnection between our world and the source of all Goodness, the Zohar says God’s Name is not complete. 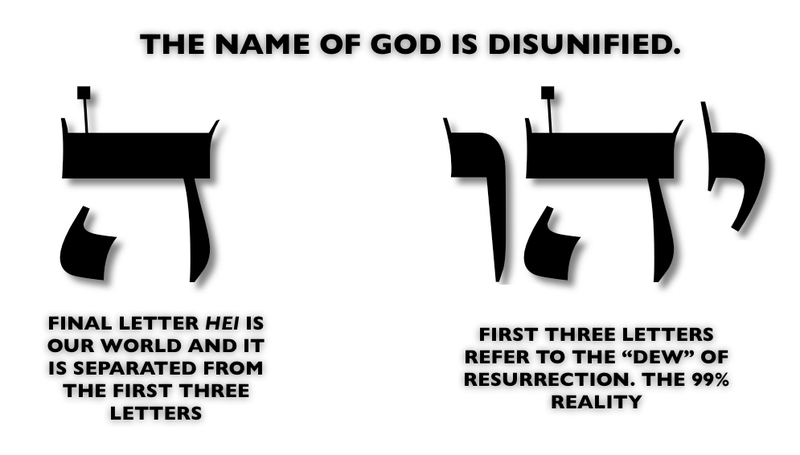 God’s Name is not unified. By now, you should realize we are not talking about a literal name like Bob, Sally, Gary and Sandra! We are referring to the very structure of reality, the seen and unseen dimensions that comprise reality. We are talking about the microscopic quantum realm, which physicists tell us is a sea of infinite energy. What physicists don’t yet realize is that this energy is divine consciousness. God Consciousness. God energy. Let’s just call it Light. In simple terms, our 1% physical reality is disconnected from 99% reality, the source of all Light and happiness. What ever you want from life, you can find it in the 99%. What ever it is that you are missing and the lack is causing you unhappiness, it’s waiting for you in the 99% realm. We are in pain when we are not drawing sustenance, life force, blessings and Light from this hidden reality. So the problem is disconnection. We’re unplugged. The early Christian fathers and original Doctors of the Church, the very people who helped build Christianity just after Jesus, they all admitted that they could not find the word Golgotha anywhere in ancient Hebrew writings. And they further admitted they did not know why this word was used. To this day, Golgotha remains a mystery. 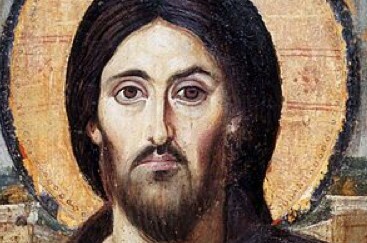 These are the mysteries that Jesus taught ONLY to his closest disciples. These are the mysteries that only Rabbi Shimon Bar Yochai, Rabbi Akiva and their inner circle understood. The early Christian Fathers admitted that there was a secret Judaism and a secret Christianity and that both were identical. Origen, one of the earliest Christian Fathers (look him up on Wikipedia) says there is a spiritual Gospel that has all the inner secrets of Christianity that Jesus taught secretly only to his closest disciples. Origen says the literal Gospels do not reveal these secrets. 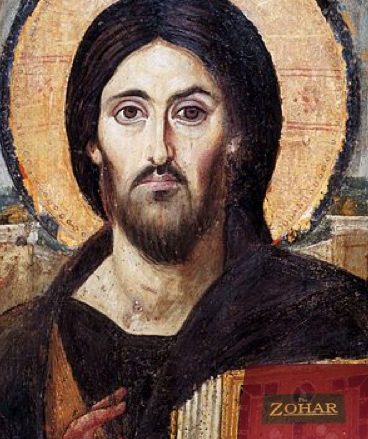 For the masses, both Origen and the New Testament tell us that Jesus spoke in parable. Origen admits that the people were just not ready to understand the secrets of Christianity and thus, the secrets of Judaism. Which leads us to the Zohar. Golgotha is the spiritual realm in the Ten Sephirot (Tree of Life) — the hidden dimensions that we call the 99%. It is called the “skull” because it is to be found at the very top and head of the spiritual worlds. It’s that simple. The Zohar uses the word Golgotha (skull) to denote the highest dimension of the Tree of Life, the Ten Sephirot, and the Zohar used metaphors like Golgotha (skull) to keep the wisdom secret and simple at the same time. The word leaked out into the mainstream, after Jesus had used it to explain the Tree of Life and the workings of the upper concealed heavens, but the Christian Fathers did not know why Golgotha was used. They took it literally. So, these hidden dimension also contain a realm called Akita Kadisha, the place where the dew comes from to resurrect the dead. Atika Kadish is also part of the dimension called Golgotha! They are found in the same place on the Tree of Life. The Zohar has many sections that are actually called Golgotha. In even simpler terms, Golgotha refers to the 99% reality. Golgotha was never about a physical location. It’s about a spiritual dimension. The reason that the literal story of Golgotha speaks about Jesus’s death and resurrection is because the Zohar says Golgotha and Atika Kadisha are the place where we resurrect everything that has died in our life. Whether it be happiness, health, a relationship, a business, or peace of mind, if we lost it, it’s because it died. If you want it back, you must “resurrect it” by connecting yourself to the realm called Golgotha. 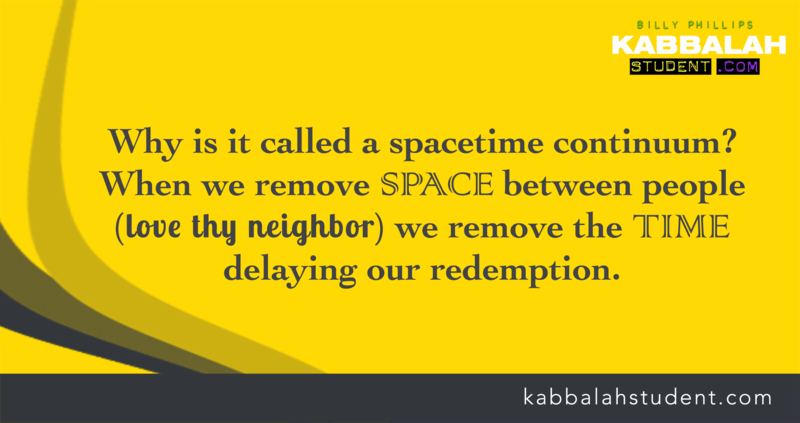 How we make that connection is what Kabbalah is all about. 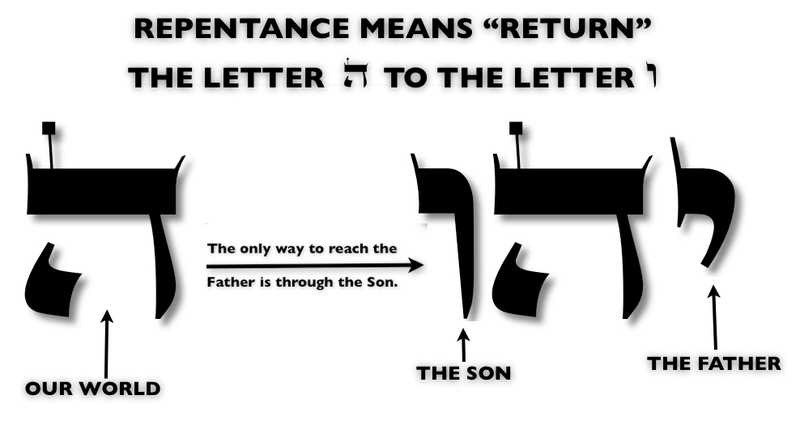 Rav Isaac Luria teaches only through repentance (inner change, and not by saying I’m sorry) can we reconnect to resurrect our happiness and resurrect what ever has died in our life. When enough individual people reconnect, then the gates of the 99% will open wide enough so that even the dead will resurrect and immortal existence (Messiah) will arrive. This is the long-held, tightly guarded Kabbalistic secret behind the teachings of Jesus concerning Golgotha, Resurrection and repentance. Let’s now explore and understand the true meaning of repentance. We are returning ourselves, and this world, to the 99%. We are returning the final letter Hei, in God’s Name, back to the first three letters to unify God’s Name and thus, unify our world with the 99% reality. This is the secret of the dew. The dew is the three letters of God’s Name that are returning ourselves too.This is why they share the same numerical value. It was a secret code to let us know what’s really taking place. This is why the dew is associated with resurrection in the Zohar. When we return or reconnect to the 99% (symbolized by the three letters of God’s Name) the Light goes back on. The code name for that is resurrection. When you unplug a light from the wall socket and disconnect from the electrical energy, the light in the room dies. You have darkness. If you want to resurrect to the light again, plug the lamp back into the wall socket. The divine letter that the letter Hei reconnects to in God’s Name is the letter Vav. The Vav is called “The Son” in the Zohar . And the first letter of God’s Name (Yod) is called “The Father” (Abba). The secret of Christianity and the secret of the Torah and Zohar. This explains Jesus’ teachings that says one must connect to the Son in order to connect to theFather. It’s all about unifying God’s Name, unifying our world with the spiritual realm of the 99%. This is why Christianity preaches repentance so much. But without Kabbalah and Zohar to understand the true meaning of repentance, which means to return, our world remains in darkness. This is why Christians and Israelites have been repenting for 2000 years yet wars rage on, disease rages on and darkness continues to rule. It’s like praying for the light in a dark room to come on without plugging in the lamp. Your prayers will never work. Next week’s Torah portion after Emor is Behar. This specific portion explains the secret of the phrase “Son of God” or “Son of the Holy One”. As we just learned, The Son refers to both the letter Vav. But in the Torah portion called Behar, we ALSO learn from the Zohar that the phrase the Son of the Holy One refers to the man who masters the Holy Wisdom of Kabbalah to transform his nature and achieve oneness with God. The Son of God is the one who reconnects to Golgotha to resurrect the Light that was lost. I will be sharing these secrets about Christianity and Zohar and the Holy Grail in Spain, next week, during the Torah portion of Behar. How coincidental is that? The Kabbalists tell us Jesus came to redeem the gentile nations by sharing Kabbalah. He gave the secrets to his close disciples and he gave parables to the masses. Moses came down from the Sinai mountain with the Tablets bringing the world the Light of Immortality and Rabbi Shimon came out of the cave of the mountain with the Zohar which contains the same Light of Immortality. This Light comes from the realm of Golgotha and Atika Kadisha. Please share. The quicker we bring the Light and truth of Zohar to mankind, the quicker we unify God’s Name which means, reconnecting ourselves and this world to the 99% reality and turning on the Light, once and for all, to forever banish all forms of darkness. Thank you, thank you, thank you for sharing this. I’m so in awe, and so grateful to meditate on it and consciously return to the Light. Thank you so much for this!! It will bring much more light for sure. What´s about the second letter “hey” wich is between the son (vav) and the father (jud)? Why is there not a direct way from son to father? And what ist te meaning of the “hey” between father and son? The second letter hei is known as the “mother” metaphorically speaking. So when the Father and Mother unite/connect, the produce an offspring — the son! And the final hei is known as the daughter. So it’s all about sharing/receiving, male/female, Light/Vessel. Tal is the word for the dew which resurrects the dead and has a numerical value of 39. How is this the same value as the first three letters of God’s name wbich is 21? using the gematria known as milui.